Ah, I meant... did FFRK add anti-emulator DRM or somesuch? I know a lot of the mobile games did back in the day. Ah, so that's how far I got. And ... apparently they added the ability to equip 3 Record Materia at once? Characters can get their own personal Legend Materia, that they can equip two of, from their Legend Dive or from relics. Edit: Oh, they added realm specific ... permanent relic draws? It says 15 mythril for the first 11 pull, does it go away afterwards, or go to 30 mythril cost or something? Do you remember Record Dives? Where you used items called Motes to increase a (level 65+) character’s power by unlocking nodes based on classic jobs? Legend Dives are what you unlock when you finish a Record Dive, for the characters that have it. The nodes require even more rare Motes, and then provide more and more powerful upgrades for spending them. Chief among the upgrades are Legend Materia. These are what go into those extra Record Materia-looking slots. A character can only ever equip Legend Materia that come from their own Legend Dive, or from special relics of theirs. They confer special and powerful abilities, usually tied to the character. For example: Bartz’s Legend Dive gives him a Materia that increases Spellblade damage, and one that fixes him a (fairly good) chance to dualcast any spellblade attack. They go to 50. Absolutely worth doing a draw per realm. We're....4 months? From the 15-per-pull getting reset. Legend dive comes from record dives. There are "motes" that come in 3*, 4*, and 5* varieties. 3* are plentiful, you'll be swimming in them. 4* are moderately rare. 5* are quite rare. 3 and 4 don't do much, just some stat boosts and in some rare cases unlocking ability schools or weapon types. They have to be done to legend dive a character. Legend diving takes 100 motes of two different types, and will unlock a boatload of stats, as well as two legend materia - that's what those other two materia slots are for. There's also legend materia from relics, you can only use two, but they give general buffs with the best type being a 35% chance to dualcast an attack/heal. There's one other category of motes - job motes. Hoard those until you know what you're doing. Honestly, this is all a lot to absorb at once. I'd start slow rolling stuff: do what you can of the events which are active, hit the realms and get some mythril, pull on some realms with the 11-pull for 15 mythril to (hopefully) get some stronger relics, and start working on the suggested tasks in the tomes. Got it. Motes were pretty darned hard to farm when I quit, I'm presuming power creep has solved that. Should I be working on clearing out the Realm dungeons or dive straight into Record dungeons? 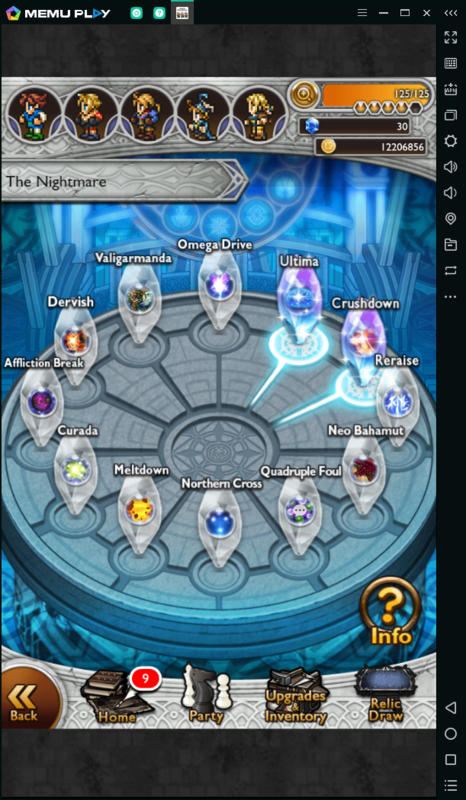 Or should I be focused on getting Nightmare complete? Realm draws are at a discounted price for the first pull, yes. After that they are full price. The items are static for now (the lists are not being added to as new realm relics release), but there is a refresh a few months down the road to keep an eye out for. Generally speaking that first pull for 15 is a great value. Though there's a lot of new things in the next month and a half that wouldn't be a bad idea to save up for as well. By the way, we’re getting a Kingdom Hearts event towards the end of February. Gonna have relics for characters from that game. Yeah. I noticed I have... ~17 hours until the FFT event ends, so I'm rushing through it. There are like 4 events up though. That's a bit of a shock. I'd say first, do as much of the event content that you can as it is time sensitive. Might as well get the easy mythril there first, then you can focus on realm/record stuff. You'll likely start getting newer relics and you'll be able to break most of the Nightmare stuff in half, so I'd leave it for later. Mythril is still valuable, and the more you can gather from the easier stuff, the better. Huh. Premium Passes. They added a cheap sub to the game. That's interesting. Edit: Ah, I can't go into Mote dungeons anymore. Need to go do the books, apparently. I do have books 1 to 3 done -- is there any thing particularly overpowered/useful from those early relic choices? Edit: Hm. Finish book 4 (had an easy Elite realm quest to do), then just had to do the... XP bonus dungeon once and a Raid (that's new) to finish book 5. Book 4 unlocked The Nightmare and Raid Dungeons; Book 5 unlocked Equipment reforging (? ), as well as Record Spheres and a bunch of power up dungeons. Book 6 I had already completed, which unlocked Mote dungeons. So that's how they handle the feature creep -- they lock it behind the quest system. Interesting. The Premium Passes, and the whole gem Shop are a recent thing and does not seem to have found favor with the community in general. I'd personally stay away from that unless they get smart and offer reasonable packages. Book 1 selections aren't particularly great, I'd say it's either a selection to complete a favorite character, or grab a +element item for the boost. Book 2 is a similar situation; Y'shtola's Thyrus is Wall, though you also get Sentinel's Grimoire so it's not essential. Book 3, Arc's SSB is pretty decent. An Instant heal with Party Physical Blink is a pretty impressive package for an SSB. I’m so close to winning against h but I just don’t see how to get there. His constant slow and attack debuff makes it really hard to finish. He seems to go crazy at 26 seconds and attack 75 times in a row. Yeah the Gem store just... eeeeh. Odd. Bu the premium passes are actually kinda interesting. I always thought that a mobile game like this should give something like the premium pass if you spend RMT on it - like, pay for a gem roll gatcha, and the daily gatcha gets a bonus for a month, or you get passive boosts for a few weeks, or whatnot. I think I might have Thyrus, I'll have to look. Don't suppose they ever added a way to CSV export your item list eh? heh. I have Sentinel's Grimoire already (think it's actually Sentinel's Grimoire++). Arc's definitely sounds like the best one there. What about the other books gatchas? I've already unlocked up to and most of the way through Book 7 -- just have to farm through a 160 Raid / 160 Nightmare, and a few Nightmare maps. Edit: Uh, wow. I have 77 Soul of Heroes. I can buy out all the characters that have been released in the past 2 years and then some. 56 Memory Crystal Loads, 25 MCL2, and 7 MCL3. I usually inherit Spell Ward on my Dampen Magicite, but I'm wondering if I should put Blade Ward on Hecatoncheir, since it already has RES boon. On the subject of Unique Soul Break selections: it all depends on what you have and what you need, of course. But i believe book 2 has Gordon’s (II) Flame Shield as an option. The soul break itself isn’t super great anymore, but the shield itself offers a Moderate resistance to the Fire element. They never give armour anything above Minor resistance anymore, so that could be a nice choice to have, since that frees up a character’s accessory slot to use something else, if you’re fighting fire. There are a few cool SSB like Arc's (Physical Blink) that I would pick up. btw, since I'm still stuck at Quetz I'm wondering if I should pick up OK's pUSB or another Earth USB? I just realized I have Orlandeu's USB now too...so I can maybe use him instead of Bartz here. Onion Knight is crazy strong. With his pUSB he's in my Quetz, Phoenix, and Mateus clears, and was in my prototype Famfrit kill. I haven't cracked Syldra, but he might make that. He was also in my Hecatoncheir clear with his BSB. 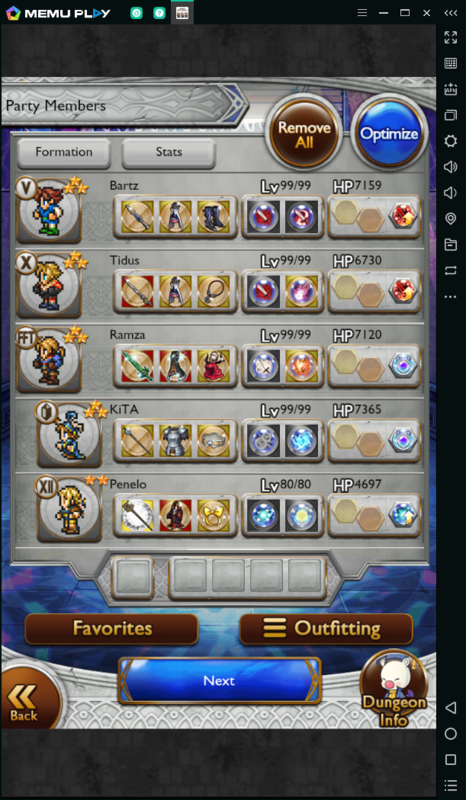 With his mUSB he's in all my 5* Magicite magic vulnerable clears. Caveat: part of this is because of his LMR, to start with instant cast 2. I do have his LMR too. I might pick it up. Man in retrospect, I wonder if Chains were a good idea at all. I feel REALLY gimped without a good chain in certain fights. Making a few gatekeeper relics you have to have to do content is a great idea for their bottom line. Not so great for players but eh. They’re adding in free chains in Japan now because yea magicite is sort of built around them. Up to date on record and realm dungeons at least. The most recent realms dungeons were all auto except for elites which need silly breaks. The record dungeons well shiva wasn't too bad, but the judges were awful. Ended up just stalling on phase one to build a full bar of meter on tyro and most of a bar on others. Heck is proving rough. I’m trying to make use of Luneth’s Arcane, but I can’t get the timing down. It comes down to me not yet managing to survive the final phase’s opening combo (savage looming —> Gaia rush —> Savage Salvo —> chain cannons —> 1 second pause —> Headbutt —> Savage Salvo —> chain cannons). If I use the Arcane early, I can get full damage, but I basically push into this phase early. If I wait to try and push past this phase, Luneth tends to die outright, and he doesn’t have the ATK power for proper damage with it after Savage Salvo in any case. Yeah this fight really wants arcanes to close it off. Phase 3 is -50% Atk/Mag for 5 secs but its cast often enough to be constantly up AND constant haste removal. Also damage goes way up. That extra damage is down to his use of Savage Looming Wrath, which boosts his ATK and DEF by 30% for a few seconds. Which theoretically means you could cancel it with the right soul break (unlike Syldra’s chesty DEF/RES/MND combo), but he recasts it often enough that you’d probably be better off using a debuff that “stacks” with ATK/DEF. ...huh. Maybe I should try that. Give Onion Power Breakdown to pair with Flash Disaster. Can’t hurt to try, I suppose. What about Mug Bloodlust to cancel Savage Looming Wrath? You can't mug bloodlust fast enough even if you are chain casting it. Maybe with instant cast? He's stupid fast. I had my best run with RW Fabula Healing. Got him to within one more Cloud USB of dying. Even rotating instant cast full heals on two characters its too much damage too fast. That's three magicites I can almost beat. I wouldn't feel as bad if I hadn't honed and dived extensively for all of them. True. I had forgotten. Of course, that depends on who I can field. If you have a good wind Thief like Zidane or Vaan, that could be a good idea. Mind, the two will cancel each other, so the ATK boost when he uses Savage Wrath will be more pronounced. New idea: forget Typhon as the primary Magicite. Heck’s rage comes back so effortlessly that breaking it may as well not even happen. Plus, it doesn’t increase his defense. Instead, I’ll try Enkidu. An on-demand Medica+Esunaga, applied when he Blinds 2 of my DPS, should be the thing to have here. Yes, I’ll lose out on the damage Typhon does, but this timing issue is probably worth a lot more than that. I was using Unicorn myself. Although that interferes with Elarra USB. I suppose the Def/res break could be slightly useful on Enkidu. Enkidu’s Discord does an ATK/MAG break, IIRC. And huh. Why didn’t I think of Unicorn? An extra healer* is a beautiful thing, and a single Astra is enough to protect my DPS, if I put them in slots 1, 3, or 5. Not needing to dedicate any brain space to Headbutt would be lovely. Assuming Hedgerows is hecateochaiasinrew do you have an Ice chain you can use with snowspell strike? Finally got a first kill on Hecatoncheir. I kept getting down to the 90-95% before wiping. For me, holding off until the big guns can more or less push the last chunk of damage all at once did it for me. I don't have UltraCloud, but a fairly stacked wind team otherwise. Went with Enkidu for main Magicite. I haven't done Typhon/Syldra yet, so just the 4*s for wind and defense, an Evrae, and a defensive magicite. I didn't bother with the blindness until slot 1 got hit (Bartz), then popped Enkidu. Waited on the AOSBs until I thought they could kill him in one run (it didn't, but I was close enough that I could withstand a last barrage). I'm probably going to forget how I did it, but cracking it the first time is half the battle. It was a 30.14 second run. How you did it was AOSB! Did you bring Luneth with no SB?